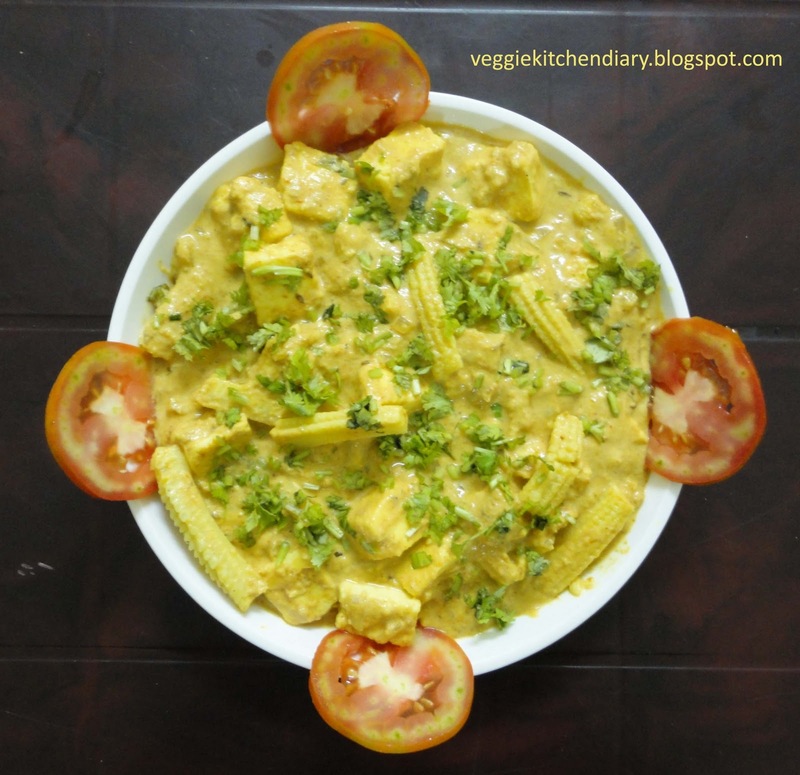 Paneer Baby Corn masala curry is rich in lutein (an antioxidant), calcium, folate, thiamine and protein. Substituting tofu for paneer can make it an excellent ,tasty low calorie recipe for weight-watchers. 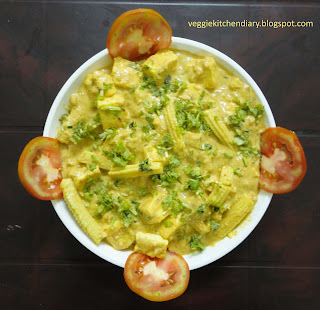 Paneer Baby Corn masala is a tasty preparation with an unique combination of baby corn with a succulent paneer and delectable spicy creamy gravy. Definitely worth to try and serve with paratha ,Naan or with tandoori roti. 1. Chop 1 of the onions finely and keep aside. 2.Blanch the baby corn in salted boiling water for 3-4 min. 3. Chop another onion into large pieces along with the ginger, green chili, garlic,Corainder leaves and tomatoes and put it through a blender/ mixer with as little water as possible to make a fine paste. 4. Heat butter in a kadai and when the butter melt, add the cumin seeds. When they splutter, add the chopped onions and saute till they are golden brown. 5. Next add the tomato-onion-ginger-garlic-chili puree and saute till you see the butter/ghee come afloat. The gravy should turn golden brown. 6. Now add the cashew and melon seeds powder to it and saute for a couple more minutes. 7. Add the turmeric, chili powder, garam masala, cumin and coriander powder , salt and saute the gravy for 3-4 minutes. 8. Add in the chopped baby corn and paneer pieces and cook for 10-15 more minutes. 9. Finally add Fresh cream, kasuri methi and saute for 2-3 min.